Dr Stefan Rübenacke, in charge of batteries and chargers for power tools at Bosch Professional, answers some key questions around battery technology and where it is headed in the future. Bosch is pursuing the development of high-performance batteries. How does this fit into your long-term strategy? 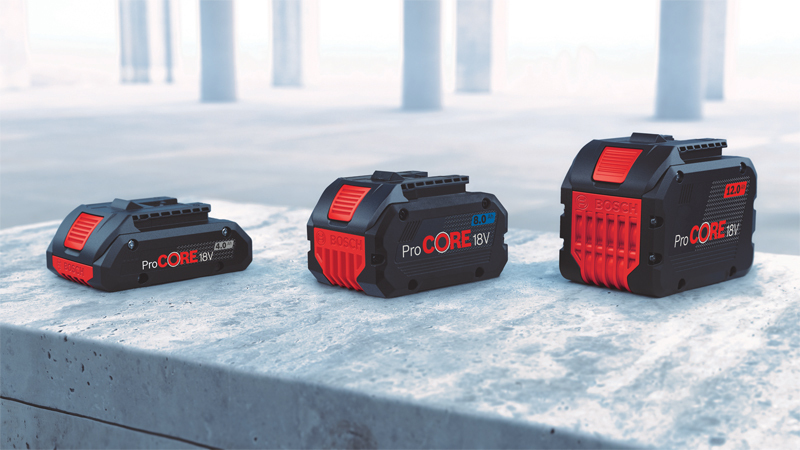 In the long run, the basic aim of further developing our new high-performance batteries is to replace corded tools with cordless tools, something we’ve come a significant step closer to with the ProCORE18V series. We’ve created a new performance class with our ProCORE18V batteries. Lithium-ion cells have been at the heart of cordless technology for many years now, but we’re using a new kind of cell in the ProCORE18V generation. This technology was originally developed for automotive applications, but we’ve modified it to suit our needs. The 21700 cell will be the new market standard. This type of cell has amazing properties. It enables the capacity of the individual cells – i.e. the amp hours – to be increased even further, which in turn makes it possible for us to extend the battery life even more. You mentioned a battery series, how many ProCORE18V batteries will there be and how will they be different from one another? We are launching three different ProCORE18V batteries to the market. The basic idea behind this is to offer our customers the exact power and performance they need for the jobs they want to do. The ProCORE18V range therefore contains single-layer, two-layer and three-layer batteries. In the compact ProCORE18V 4.0 Ah battery, the higher capacity of the new cells allows a single-layer structure to be used. This is advantageous because it makes the battery significantly smaller and lighter than the standard two-layer 4.0 Ah version, while providing the same performance. We’ve developed the performance ProCORE18V 8.0 Ah battery for a broader range of applications, including more power-intensive tasks. Its power is comparable to that of a power pack with 1600 watts. For particularly intensive applications using cordless rotary hammers, angle grinders or circular saws, the endurance ProCORE18V 12.0 Ah battery is available from 2019. Can single-layer batteries really replace two-layer batteries? This is precisely what makes these high-performance batteries so innovative. We’re now generating the kind of performance profiles with single-layer batteries that have only been conceivable with two-layer batteries in the past. This means we’re entering dimensions of performance previously reserved for corded power tools. Increasing the capacity increases the battery life. Have you been able to improve the overall service life too? Yes, we’ve improved how heat is managed in the batteries. Our CoolPack technology ensures that the heat generated inside the cell is conveyed outwards with maximum efficiency. Heat dissipation is maximised by the interaction of multiple components. The housing and the cooling elements in the interior, which completely encase each individual cell, are made from high-density polyethylene. Both the material and the special design, aimed at increasing the surface area, allow better heat dissipation. The battery is also designed without any gaps, meaning that any heat produced cannot be stored. Furthermore, we’ve developed a new kind of cell connector technology. The copper surfaces that join the individual cells are made from thick copper plate. We’ve developed a new manufacturing technique for this, whereby the copper cell connectors are laser welded. This manufacturing technique is the only one of its kind on the market. Its advantage lies in the process being highly automated and consequently highly precise. The way these components interact with each other makes for outstanding heat management, which increases the service life of the battery. Better performance and longer service life are important to tradespeople, as are planning security and cost certainty. Are the new ProCORE18V batteries compatible with the existing system and, if so, will they remain so in the future? We aim to keep all the generations of tools we have on the market compatible with each other. Whether tradespeople have 12-volt, 18-volt or 36-volt tools, we will continue to offer them full compatibility within the voltage class they use. They can rest assured that they will be able to combine their existing cordless tools with new batteries and vice versa. This is thanks to the intelligent technology we employ in our batteries, tools and chargers. They communicate with each other across the permitted current, temperature and charging voltage ranges via a communication interface. For example, the interface tells the charger and the cordless tool whether the battery is single-layer, two-layer or three-layer and which generation it belongs to. It’s this intelligent technology that means we can guarantee full compatibility both now and in the future. The user doesn’t need to worry about a thing – their tool will detect the battery and vice versa. Batteries are pretty useless without chargers. Do tradespeople stand to benefit from innovation in this regard too? Yes, we’ve been further developing our battery chargers as well. The Bosch GAL 18 V-160 C Professional Charger is the world’s first charger that can be networked and it’s currently the fastest charger for 18-volt batteries too. Producing a maximum 16A charging current, it will charge the ProCORE18V 12.0 Ah to 80% in about 35 minutes. It can be used for all Bosch 14.4 V as well as 18 V batteries. That’s twice as fast as the previous charger, the GAL 1880 Professional. And this is where our development trend is heading. From 2019, we will have launched a new charger generation that saves tradespeople even more time and improves efficiency by offering various different charging modes − from one that helps preserve the battery through to one that’s ultra-fast. What’s more, we’ve developed this new charger generation to have an especially compact design. As with our high-performance batteries, the basic idea here is to give users the exact power and performance they need to help them get the job done, whatever that job may be.